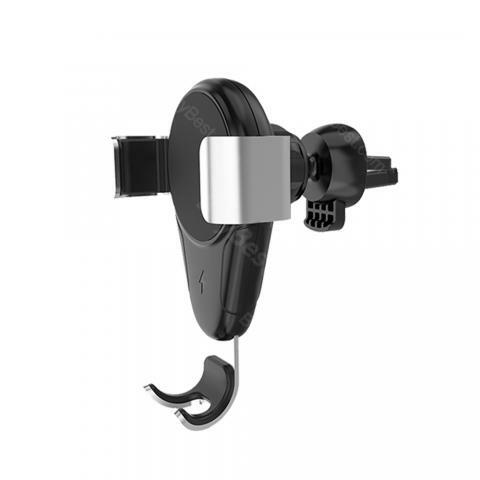 ET Z73 Wireless Car Charger Phone Holder, which adopts advanced power management with several protection to ensure safety, is suitable for IOS and Android. Wireless Car Charger Phone Holder comes with one-hand operation, which is air vent mounting, gravity and linkage design. When you put your phone into it, arms automatically close. Plug and play, charge without cable, easy of use by wireless charging functions. Head-up design bring a good viewing to the driver and you only need to concentrate on driving. Strong arms keep your phone firmly and keep you and your family safety. Advanced power management provides multiple protections, such as overcharge, over-current, short-circuit, FOD etc. Full production for your mobile phone. Wireless Car Charger Phone Holder fits for iPhone X,8,8 Plus-Samsung Galaxy S6/S6 Edge-Google Nexus 4/Nexus 5/Nexus 6-Nokia Lumia 920/1020/928, Lumia 950/950 XL,FAST CHARGE-Samsung Galaxy Note 8/Note 5/S8/S8 Plus/S7/S7 Edge/S6 Edge. So far this has been an amazing charger. One of my friends kids broke my USB cord so I decided to try a wireless charger. Honestly ive never had a better charger. Its fast charging if you use it with your Samsung plug. I love how the colors change from blue to green when charging then back to blue when its charged. It doesn't work with my case on because I have a popsocket but other than that I'm obsessed with this charger! Loved this! It automatically opens and closes when the motion sensor detects something moving towards it. So as you approach it with your phone, the clasps open automatically and then close to give your phone a secure fit. Extremely impressed by this little feature that somehow was ignored by so many generations os these car chargers until now. Takes away so much of the driving+navigating frustration. Good design! Work automatically. It is easy to assembly. But the instructions are a little bit confusing. Overall, the design is smart. This car holder is comprised of the magnetic Qi pad itself and a mount that clips to a vent with a very strong grip (rubber padded). It comes with a USB cable and a tiny two USB port cigarette lighter adapter. The box also contains three adhesive cable runners for a neat installation, and two adhesive steel rings.